Catalogued as a ‘travelling ensemble’ these two oak fitted cases of silver tableware, below, conjure up images of lavish inter-war era picnics. 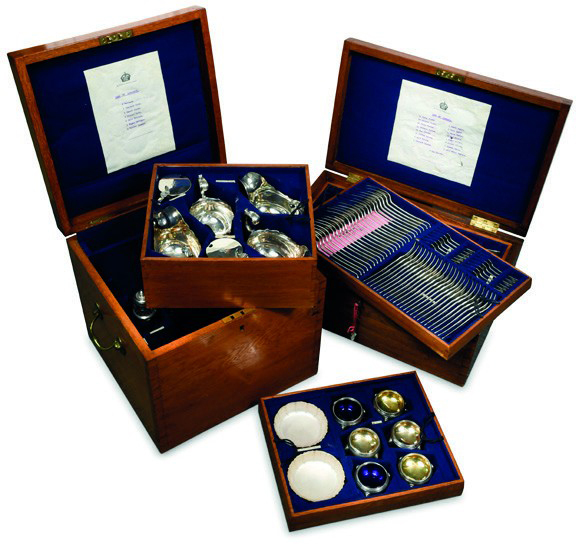 Two 1920s oak fitted cases of silver tableware sold for £7000 at Cheffins. Offered at Cheffins (22.5% buyer’s premium) in Cambridge on October 25, one canteen by Garrard & Co, London 1926, comprised a 174-piece set of flatware weighing 278oz. The other contained salts and butter dishes with glass lines, sauce boats, mustards, by Stokes & Ireland, Chester 1921, and crested pepper casters and a sugar caster marked London 1919-26. The lower end of the £3000-5000 estimate reflected its melt value. However, the opulent offering took a bid of £7000.